Roll Tech (1) Piece Wheel: Is Lightweight but yet super strong for todays UTV market making it light enough for the sand yet strong enough for any trail. 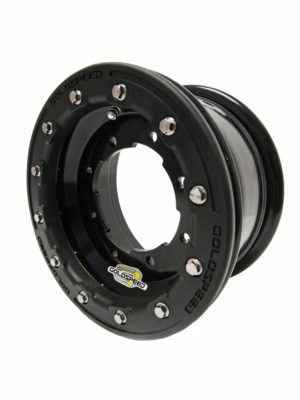 Roll Tech (2) Piece Wheel: Is super strong and was designed and tested for the U.S. Military. This wheel is currently used on U.S. Military UTV & ATV’s, so a super strong removable billet center & outer ring was specifically engineered for this wheel giving it a load rating greater than the competition. Weight w/o billet center 13.5 lbs. The Wheel looks nice. The price on the website is that with free shipping ? I was looking at the DWT sectors and this ROLL Tec wheel seems to be the only wheels with a removable billet center. I like the fact I can change the center to fit my other machine. The DWT sector I would have to deal with the possibility of the o- rings leaking being the wheel half’s separate and on this ROLL Tec only the center removes.